Description: The Million Waves Project joined forces with Australian non-profit Greenbatch and 3DUniverse to put some of the millions of pieces of plastic in the ocean to good use. The trio is now able to use 3D print technology to create new prosthetic limbs out of the plastic waste. Moving forward, 3DUniverse said that it hopes to offer prosthetic limbs produced this way for as little as $45. Description: 3D print is being used in various ways across the medical industry, helping doctors and surgeons with their work. 3D Systems worked with OpHeart, a non-profit organisation committed to helping children with life-threatening heart defects receive the best medical treatment possible, to produce anatomical models to assist heart surgeons with operations. 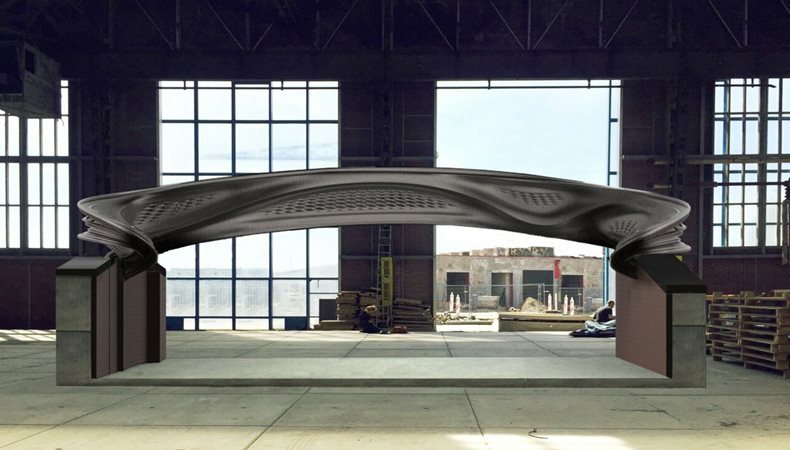 Description: Amsterdam-based start-up MX3D set a world-first last year when it completed work on what is believed to be the first 3D-printed steel pedestrian bridge. The eye-catching structure will be installed across one of the Dutch capital’s famous canals. All aboard the beer bus! Description: Canadian company Media Resources produced this ‘Beer Bus Shelter’ for convenience store chain Circle K. The structure is designed to mimic a classic six-pack and the bottles were 3D printed on a Massivit 1800. Description: While fashion has been taking advantage of developments in the textile print sector for a number of years now, it seems designers are starting to look at how 3D print can also enhance their work. Julia Daviy debuted her new 3D-printed designs in September, including this example, ‘The Fragility Dress’. Daviy prints each piece of clothing in two- to four parts using large-scale printing technology, with the majority of her work printed on the industrial large-format FDM 3D printers using TPU materials. Description: Marie 3D teamed up with coffee machine manufacturer Senseo to produce this creative application. The giant coffee machine was fitted to the top of a car and driven around Paris during the Tour de France cycling event. Marie 3D used Massivit 3D technology to produce the application. Description: Why not kick back and relax after a long week of work with a 3D-printed cocktail? Produced in partnership with Bulleit Frontier Whiskey and a team of mixologists, robotics pioneer Benjamin Grimeil came up with this unusual application to help promote the whiskey brand. Description: Mighty Jabba’s Collection managed to 3D-print a “life-size” model of iconic Star Wars character, Jabba the Hutt. The team used a Creality CR-10 S4 and Creality CR-10 S5 to create the piece. Description: Stratasys teamed up with USA Luge to support the US team at the 2018 winter Olympic Games in PyeongChang, South Korea. Stratasys used its Fused Deposition Modeling 3D printing technology to produce the ‘Doubles Tower’ mandrel, which is used to help position riders’ legs during competition. Such was the success of the partnership that US Chris Mazdzer won the silver medal in the men’s single event. Description: If you’re hit by a sudden snowstorm, why not 3D-print your way out of trouble? The team at Spyker Workshop have developed a new offering that allows customers to 3D-print their own 2X Spyker KAT snow plough from home. Description: Media Resources produced this giant version of American folklore hero, Paul Bunyan for a movie sequel based on Stephen King’s “IT”. The company used Massivit 3D technology to complete the head, hands, and boots of the giant, which measured in at 7.9 metres tall. Bringing the ancient world to life! Description: 3D print leader Stratasys teamed up with Google Arts and Culture to re-imagine some of the world’s most famous artifacts and historical monuments in 3D print form. Produced on the Stratasys J750 3D Printer, the picture shows a miniature version of the Ayutthaya temple in Thailand. Description: Composite Images used its Massivit 1800 to 3D print this 2m-high shoe to promote Carolina Herrera’s Good Girl perfume bottle. The piece took just 13 hours to print, followed by assembly, sanding, filling and painting. Description: METROPOLE used its Massivit 1800 3D printer to produce this full-size triceratops to promote a paleontology exhibition at the Musée national d'Histoire naturelle in Paris. The piece took just two days to 3D print, measuring in at 1.8m wide, 2.33m long and 3m high. Description: Little Dexter Clark has had a tough start in life, with the two-year-old having undergone a major operation to save his life. Doctors had identified an issue with his kidney before he was born and knew they had to operate, but because he was so small, this made the situation very difficult. Using Stratasys 3D print technology, doctors were able to produce a model of Dexter’s kidneys to see how they could operate. The project proved a huge success, with Dexter’s father Brendan donating his kidney and ensuring a healthy future for his son. Description: Italian print provider Colorzenith 3D printed a life-size replica of classic Italian car Lancia B24 for the Don Pasquale opera. Designed by Giò Forma, the car was produced on a Massivit 1800 3D printer in just four days. The vehicle features in one of the most famous scenes in the opera where soprano, Rosa Feola, flies over the stage performing inside it. Description: Dangling Carrot Creative used its Massivit 1800 3D printer to create this incredible model of a Poe Dameron X-Wing Fighter, one of the famous ships from the Star Wars film franchise, to help make a teenager’s dream come true. Star Wars fanatic, 13-year-old Vedant Singhania, received the model from not-for-profit, Magic Wheelchair, at Comic-Con. Description: Another fashion brand taking advantage of 3D print technology is shoe manufacturer PLAE. The company allows customers to 3D print their soles from home, with PLAE saying allows for maximum comfort when wearing its shoes. Pictured here is PLAE’s Mulberry, complete with 3D-printed soles. Description: 3D Systems and Historic Royal Palaces in the UK collaborated on an interesting project to help restore the Kew UNESCO World Heritage site, with the addition of 3D-printed dragons. 3D Systems scanned a wood carving of the dragons, which were removed from the site in the 1780s to allow for roof repairs but were never replaced. The new dragons now stand proudly at the famous site. Description: What is it with 3D print and giant footwear? We complete our top 20 with this oversized ski booth, courtesy of print service provider Marie 3D and Massivit 3D for the annual SkiDeal Week event. A Massivit 1800 3D printer was used to create the boot. While some print service providers continue to distance themselves from 3D print, saying it is too far away from traditional print work to be considered a realistic proposition, there is no escaping the popularity of this market and the amount of work on offer. By working with some of the manufacturers listed here, you can expand your business into 3D print and take on all sorts of weird and wonderful work. FESPA Global Print Expo 2019 is Europe’s largest speciality print exhibition for screen and digital wide format print, textile printing and signage solutions. Discover some of the leading brands in 3D print, including Massivit 3D, stand F49 hall B5. Please use promo code FESG902 to register for free.